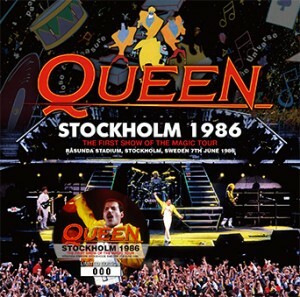 Recorded: Live at Rasunda Stadium, Stockholm, Sweden on June 7th, 1986. 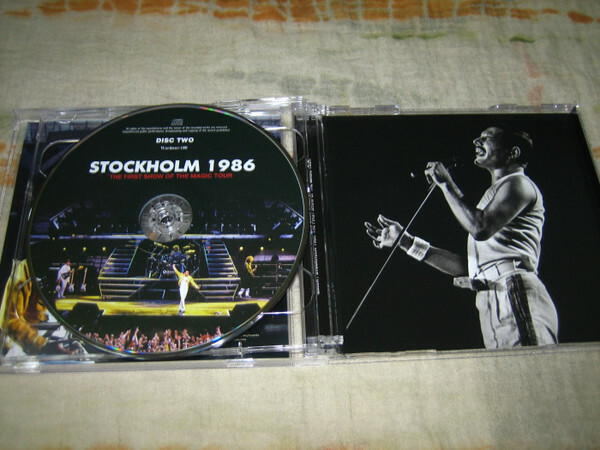 Comments: Stockholm 1986: The First Show Of The Magic Tour is a 2CD set from Rasunda Stadium, Stockholm, Sweden on June 7th, 1986. The last tour with Freddie. This show has previously been released on 2cd by Japanese label 'Gypsy Eye' in 2002, with title 'Magic In Stockholm' 2cd. Another Japanese 4 cdr bootleg has also been released in 2010 by 'Uxbridge' label, with title 'Swedish Magic Night'. I'm not sure which tape source has been used on this 2016 release. In April 2017, Wardour label released again this Stockholm concert on a 2cd. Titles on this release is 'Definitive Stockholm 1986' (Wardour 231). I guess this last release is from another tape source. From the result, the 1986 Magic tour, which has become the queen last live tour, will be a three-tenth anniversary this year. Is it the flow of time what early …. Last year from our shop, the tour the last day Crazy. Ultimate title “KNEBWORTH 1986” of S transcendence audience recordings that Mr. recorded is still fresh in memory was released. The last live at the end of the live tour, that was containment Final Live Show of the Queen in the best possible way (although John Deacon I have tossed the base) of It was this title. And is the first day of our tour to this release in that thirty anniversary of the Magic tour, I Stockholm performances of June 7 this year. 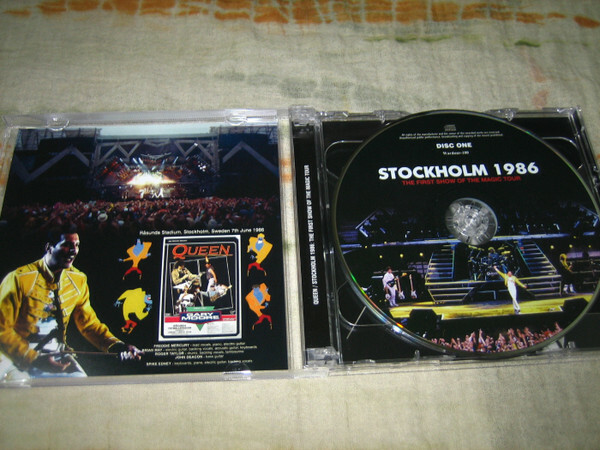 There Speaking of the Magic tour to Wembley Stadium on the 2nd minute any time of the condition, such as Hungary is the official video release of are substantial, it may also become the last of the live tour in Freddie Mercury during his lifetime to the single There is no doubt that it was closed is a big factor. Furthermore, all of the fact that large-scale tour of Europe at the venue only of the stadium-class call the big topic from that time, there was also the result that story had been raised of recording and shooting. Thus This Stockholm performance does not fit into the existence of mere tour the first day, I think in comes down to the fact that because it is the origin of live activities had also become the final tour. Queen was thinking disbanded break the hesitation in Live Aid, large-scale tour was dared by Hissage the new work has created new leaf “A KIND OF MAGIC”. This state, as the official video listed above had been proved, last hurray as a tour … it is also a result waged the Queen is imposing performance that has reached the maturity of the band. Only the strong are such an image, is really interesting playing content and atmosphere of Stockholm that this time will be released! After all, this is a tour the first day. Rock-solid serving another dimension to the play the first time, such as after the Wembley and Knebworth. Such as “One Vision” of the opening, it is not if Once went committing messed playing the first time in about seen to listen to one. Moreover, it is a recording has been audience recorded here, is also interesting sound image of the back-chorus of Roger Taylor that awfully on-state in the early stages. Thanks to the first day of the tour, yet will come from the tension of the opening number, where the back-chorus distracted to play is doubtful is pampered. From only that have familiar each picture of Knebworth and official, it is a sight that reflected in anything fresh. Opposite to the “A Kind Of Magic” is such as already show off the excellent stability of the performance, even in the repertoire from the same album, enough to know the difference of up to try to put the members care about. And if me and the first day of the tour, of course Freddie top form is tone of voice. On the evidence, without any chorus in the audience, he sang as possible at the end to one person, “I Want To Break Free” is Not the testifies eloquently to the strong first time. This tour from the previous only song chorus of the audience has been a staple in, here in the form of Freddie that Mise banged sing stoic is dignified would also be rare occasions. However, tour the first day seems to presumption of rare occasions, it will comes down to that the “Bohemian Rhapsody” is had been played subsequently to this song. One of the aims of the Magic tour, it was possible for group long-standing hesitation is Miseru by expanding the frenzy of live Aid you’ve sunny in a moment with a short stage in the afternoon to their own tour. Where is what you’ve played the “Bohemian Rhapsody” Short version in opening has created a great effect. So around that live in Stockholm is about to Sashikakaro in the middle, there is also the bold was Mise showing off this song. But unlike Live Aid that was not less than 30 minutes, it does not wipe discomfort that would pick up the Queen largest anthem at the position of the usual repertoire for a long time live. This attempt will be only the first day after all, and later was Ainari and live the second half of the play is a classic. It just even the very funny scene, but there is the fact that there to tour the first day, Freddie does not miss to hear like singing this classic in the singing voice with a sharp reminiscent of a heyday, such as 1981 and ’82. You might also rare occasions in that regard. 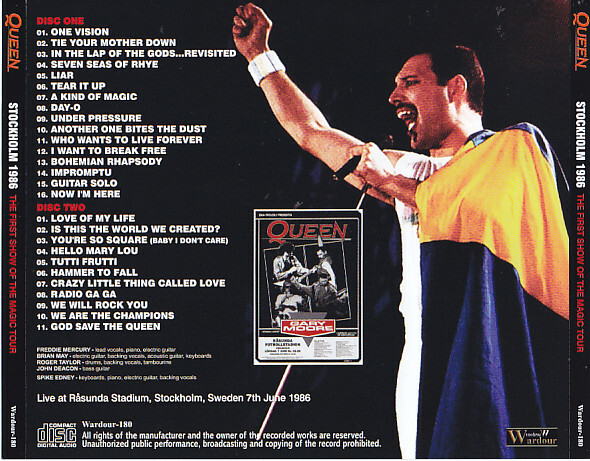 Without shake to Brian in the middle of the song, as after the “Baby I Do not Care”, “Duwa” chorus is or was still irregular, further “Hello Mary Lou” is a further middle of acoustic cover corner, here But the tour first day unique rare scene that Freddie as possible singing alone listens. And what as through the whole volume Nevertheless anyway interesting momentum of playful tea playing the first time! There is something deeply impressive considering that went promoted to the frequency of Wembley and Knebworth from here. And it is the audience recordings that were used against the current release, this is before Uxbridge label is “SWEDISH MAGIC NIGHT” 4CD-R set had been recorded when you release the “source # 1” a remastered recording. Unique sound image captured on the play in the sound quality of the field seems harder recordings of charm. A result of it was re-this time remastered, hum of bass that was worrisome from the middle live is wiped out, yet more natural, yet now enjoy direct state. This is improved when listening with headphones clear, and the sound from the speaker to the state of play of the contour hear a more pronounced (this time adjusting to the pitch which has been subtly shifted to the bonus). Originally “SWEDISH MAGIC NIGHT” itself is “MAGIC IN STOCKHOLM” in the past, resulting in high levels of mania as low Generation Upper version of the sound source, which has been released in the (here there was a advantage that the press CD) “only here Press limited press CD release of a sound source to the voice of those or “you do not put out will be finally realized. Queen last “magic” began from here!